Any cancellations or change of venue will be posted here. Shalom and welcome. My name is Rabbi Joe and I am the pastor of Congregation Elohim Mekomo (God’s Place). Since I have probably not had the pleasure of meeting you yet, I would like to tell you a little about myself. My great-grandparents were Jewish immigrants from Spain and I believe that my ministry is the result of a spiritual seed that God had placed in my heart through my ancestors. Our family recognized Yeshua (Jesus) as the Messiah and I was raised in a Christian home by two loving parents who walked with the Lord. Being brought up in a Christian home, I came to know the Lord at an early age. I attended worship services with my parents and participated in the rituals and rites of the church. However, it was not until I went to college that my relationship with God began to reach maturity. While attending Penn State University, I became involved with the Navigators Organization and began a season of intense Bible study, fellowship, and service. It was during this time that I fully and completely dedicated my life to the Lord Yeshua (Jesus). As my journey continued, I began to feel a deep passion for the study of the Hebraic roots of Christianity. Over the course of the next 30 years, I committed myself to the concentrated study of God’s Word. 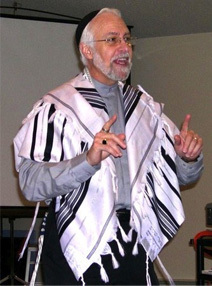 For the last 13 years, I have been involved in Jewish/Christian studies and active church leadership. During this time, I have studied Hebrew, Old and New Testament Theology, liturgy, and pastoral care. I have served as a “Shamash” (dedicated servant-leader), as a “Gabbai” (Rabbinical assistant), and as a congregational Rabbi. I am licensed and ordained through Kingsway Fellowship International. But enough about me, consider joining us for worship, and we’ll talk about Him. Thank you for your support as we continue to preach the unity of the Body of Christ. Looking forward to celebrating Passover with you this Spring.